My work cubicle is plastered with pictures. They’re not of vacations, or my husband. Even my own precious children are only supporting actors in this panorama. The pictures are, to paraphrase another notable Foxboro writer (thanks to Al Papiano), pictures of the world’s only grandchild. He is pictured with his mother, who does not look her best, one hour after his birth. He is there on the same day with a totally awed and rather disheveled looking father. I have a picture of him with the cousin-maker, his aunt and my daughter. I have a picture of him drooling trying to eat a giant red pepper just picked from the garden. My former favorite picture was of my grandson taking his first bite of solid food. I looked up at her warily, frowning just a bit. My grandson was not at all pleased with his first bite of real food. He looked distinctly worried that it might bite back. His eyes were wary, and unhappy. “Do I really look like that?” I asked anxiously. “Ohh! You’ve got to bring in a baby picture of yourself!” my co-worker continued, either oblivious to, or rather amused by my evident distress. I haven’t brought in my own baby picture. But I have a new favorite picture. 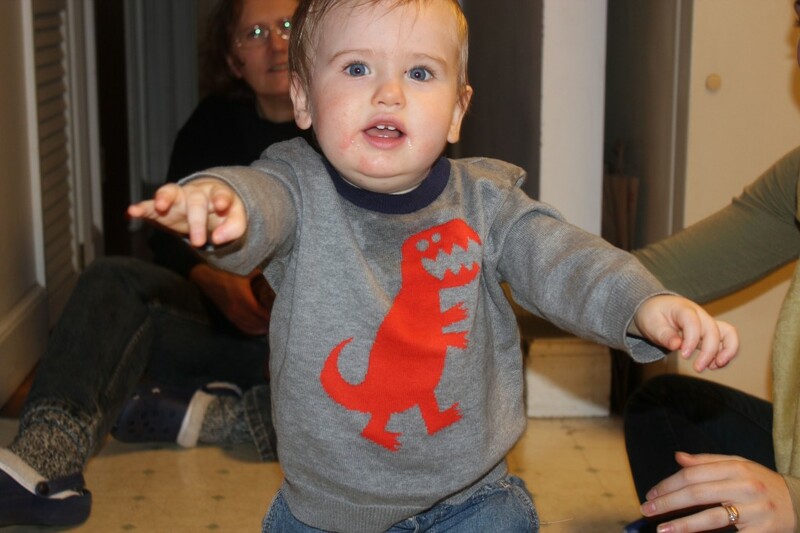 In this photo, my baby has food stains around his mouth, and is lurching forward like a zombie. His expression is a combination of raw fear, and ecstatic delight. I think I had a similar expression last spring, as I was trapped on a zip line, 50 feet above the ground. A baby’s life is full of new experiences. And my baby has mixed feeling about them. His parents had just come back from visiting the other grandparents. My husband had picked them up at the airport, and bought them to our house for grilled turkey sandwiches. I arrived home from work at the same time that they all got back from the airport. My baby was still in his car seat. He didn’t look happy. “You’re at Grandpa’s!” I informed him. “Did he just wake up?” I asked. “Yeah, and he’s really hungry.” his parents informed me. Baby’s hate to eat. They hate to have their diapers changed. They are very busy, and just don’t have the time for all that nonsense. Fortunately parents know better. And my baby was somewhat co-operative, for at least the first two minutes. We attributed this to severe hunger. His parents made the most of it, trying to rapidly shovel in a significant amount of food into his mouth. Meanwhile, relatives hovered. The cousin-maker (Aunt Tracy) had not seen my baby in a whole week, and she badly needed a cuddle. Grandpa needed a cuddle too, but he was cognizant of the parent’s own hunger issues and stayed busy making the world’s best grilled turkey sandwiches. “Oh, I’m so happy to be here.” commented the father, eyeing the sandwiches. Meanwhile, my baby had woken up sufficiently to realize that he was at Grandpa’s, a magical place strewn with an abundance of toys. But, the best toy of all was out of reach, inexplicably busy and unavailable in the forbidden kitchen. Still, my baby did his best to climb out of the highchair, but the seat-beat held him in place. Then gradually, as his hunger diminished, he used other means to make his will known. He turned his head away when the spoon came near. When his parents placed food on the table so he could squish it in his hands, and eat it, he refused and just threw it on the floor. Finally, he resorted to spitting out the pieces of delectable banana his father had placed in his mouth. “I guess he’s done.” his father finally concluded. And Grandpa was done with the turkey sandwiches! His father placed Abel on the floor and he crawled to Grampa. Grampa held out his hands and Abel stood up and then Grampa stepped back releasing Abel’s hands. Abel was focused. He was so focused on his best-ever toy, that he just plain forgot to get down and crawl. He just…walked…straight to Grandpa. Straight into Grandpa’s arms. Abel and Grandpa hugged. We all cheered. Then we all sat down on the kitchen floor and spent the rest of the night propping the baby up and sending him, lurching warily, from person to person. His father got out the camera and took pictures. Abel is a cautious baby, and he clearly had mixed emotions. You could see it in his eyes, a mixture of pride, exhilaration, and raw fear. All in all, it was a uniquely satisfying home-coming. And now I have a new favorite picture. I just hope that my co-worker doesn’t continue to insist that he looks just like me. 1 comment to He walks! He does look like Carolane. Thanks for sharing the picture and the story with us.